Most of us have seen the iconic USDA Food Guide Pyramid at some point. It was first introduced in 1992, was remade in 2005 as My Pyramid, and in 2011 was changed to My Plate. All of these eating guides incorporate the different food groups and try to give us an understanding of how to eat a healthy diet. But have you ever wondered if they are correct? Who wrote them? What research are they based on? Does profit or the food industry create a bias in these models? Why have they changed? Do you really need to eat 11 servings of grains in a day? Is there really a one size fits all diet? This article will help you understand the answers to all of these questions. The original Food Pyramid was created in 1992 by the United States Department of Agriculture. It became the uncontested model for a “healthy diet” in schools, doctor’s offices, on food labels, and in the media. For more than 20 years, Americans tried to follow this high-carbohydrate, low-fat diet recommended by the Food Pyramid. The results are in, and sadly Americans are sicker and more over weight than ever before in our nation’s history. So what went wrong? A diet high in pasteurized dairy and carbohydrates causes inflammation and an overly acidic body pH, which is an underlying factor in almost every chronic disease. (2) It is also clear that many people are allergic to or have a difficult time digesting dairy and grains. The 2005 My Pyramid model, which was like the original one turned on its side, was heavily criticized from the beginning as being too confusing and overly vague. The one good thing about this model was that it incorporated exercise as one of the “steps to a healthier you.” However, it still placed grains as the largest source of calories and did not incorporate our need for healthy fats. With the massive increase in processed foods, this model did not help Americans navigate all of these choices. Many products advertised the number of “whole grains” it contained while being full of refined sugar, food additives, trans fat, genetically modified corn and soy, preservatives, artificial colors and flavorings, and other unhealthy ingredients. (3) A great example of this is breakfast cereals. The idea that Lucky Charms, Coco Puffs or Cinnamon Toast Crunch is a good and healthy breakfast choice—just because it contains whole grains—shows how far off track we’ve gone. 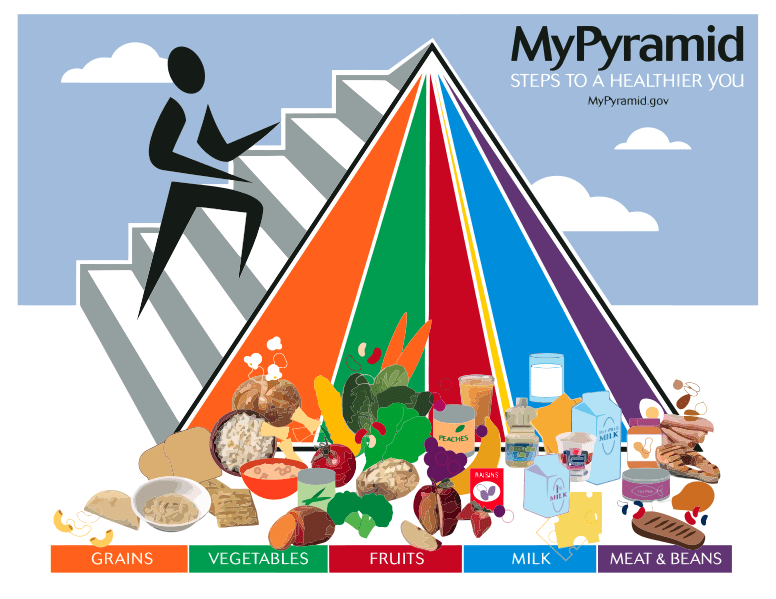 MyPyramid was a visual illustration of suggested healthy eating habits and physical activity. Like its predecessor, the Food Guide Pyramid, MyPyramid combined the government’s dietary guidelines and recommended allowances into six food groups. But instead of illustrating the number of servings based on a one-size-fits-all 2,000 calorie intake, the MyPyramid symbol itself showed six vertical color bands, each representing varying proportions of the pyramid. These colors represented the food groups as follows. Fruit Group should provide 4 daily servings, or 2 cups. Vegetable Group should provide 5 servings, or 2.5 cups. Grain Group should provide 6 ounce-equivalents (1 ounce-equivalent means 1 serving), half of which should be whole grain..
Meat and Beans Group should provide 5.5 ounce-equivalents or servings. Milk Group should provide 3 cups/servings. Oils should provide 24g or 6 teaspoons. In 2011, the new “My Plate” was introduced. This is a significant improvement from its predecessors as it is much easier to visualize what it actually means on your plate. My Plate really makes meal planning easier. Just by looking at the icon, you know right away that vegetables and fruits should take up half the plate (with the veggie portion being a bit bigger), and grains and protein foods should take up the other half (with more grains on this side). And with a side helping of dairy, you’re reminded to include milk or another dairy food (like cheese or yogurt) in your daily meal plan. Because My Plate is a divided plate, no one food group overpowers the others. That’s because dietary guidelines encourage eating a variety of foods and discourage “super-sized” portions which can lead to weight gain and obesity. Although the food guide icon has changed, the USDA’s message about eating well has stayed the same. Everyone still needs to eat lots of fruits, vegetables, and whole grains, along with lean meats or other forms of protein and low-fat dairy products. Oils provide important nutrients and are recommended in small amounts but aren’t included on the My Plate icon. Choose oils over solid fats, but limit the amount you eat. Exercise is also no longer included in the icon, but it’s still an important component of a healthy lifestyle. Everyone should and will benefit from exercise. Starting at 2 years old, kids need at least 60 minutes of moderate to physical activity each day. Criticisms are that it still does not help us navigate what kinds of foods should be in each category. Before the industrialization of our food supply, these categories were very simple. Now we are bombarded with thousands of choices and new “food products” on the shelves of the supermarket every week. So what should we eat!? The question, “what is a healthy diet?” seems to still remain once we take a deeper look at the shortcomings of these food models.